The dinkification of French leather paring knives. A completely unscientific approach. L-R: Big old knife, Medium moderately old knife, Small modern version. Sometimes I half-jokingly refer to the dinkification of tools —the tendency of tools to get smaller, lighter, more flimsy, and often less functional — over time. 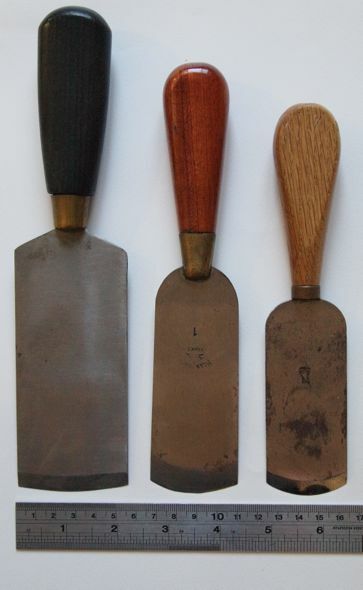 The above photo of three French Style leather paring knives from my collection illustrates this tendency nicely. I’m pretty sure they are arranged from the oldest on the left, to the newest on the right. Observe the cheapening of handle material: from ebony, to a stained wood, to a varnished one. The blades get thinner and narrower. The changes in the curve of the cutting edge is also of interest. 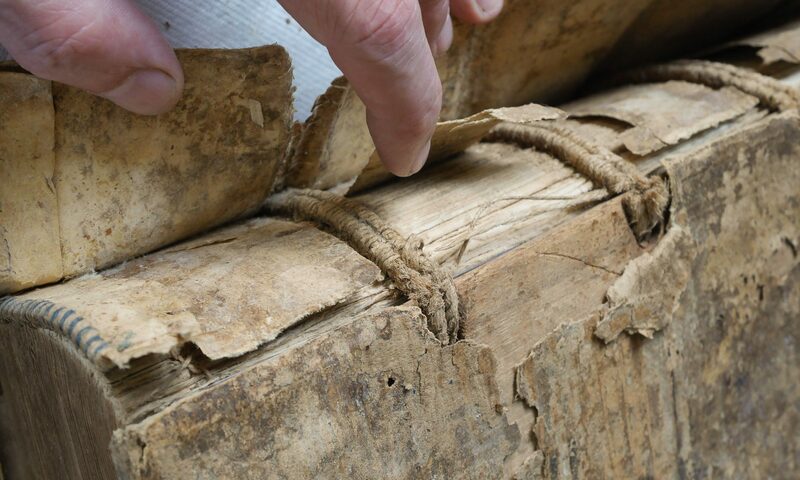 The narrowest knife also has the greatest curve, which in my experience indicates it is designed for scraping than cutting, which runs counter to what I know historically about the history of leather paring. In terms of scraping, when I learned to use the Swiss paring knife (curvature of blade and proportionate width to your “big old” but without the wooden handle) that also included scraping, especially at headcaps and corners to thin down leather. Process/motion identical to spokeshave. Sharp blade, flattish angle, light touch – works great. Good to know. This makes more sense than the more curved blade I often see people scraping with today. I wouldn’t disagree with your general thesis, or with the right-hand knife as an example, but I don’t think the other two speak to the point. To my eye the central knife is distinctly better made than the left-hand knife: notice the ferrule extending over the blade to reinforce the tang, and the good fit between the ferrule and the handle. Notice also the sharp aggressive corners of the shoulders on the left-hand blade. I see a quality difference between these two, but not an age difference. Nor would I go much from the color of the handles: I have French knives bought new in the 1990s with just that appearance, one (an atypical top-of-the-line Rouget & Ple) with a mahogany handle and two (Blanchards made for the harness trade) with bubinga handles. Many of the dark-black handles I have are dyed wood, and it is hard to tell which are dyed except where I have cut into them (for instance to improve the fit at the ferrule). The central knife is less worn than the right-hand knife, but that is different from age. I just don’t buy weight, width, and rigidity as marks of quality or function in a paring knife. A thin blade is easier to maintain, and a heavy blade tires the hand. Most of my “French” knives are inaccessible at the moment, but one of the oldest (a New York-made Westphal with a 19th-century mark and a full-width tang) is also thinner and narrower than more recent knives. Blade weight and rigidity are very much a matter of taste. So is width, and as late as 1998 Siegel offered Vergez Blanchard French knives in three widths (44 mm., 49 mm., and 54 mm.). Is your central knife a Blanchard, by the way? it has the look. I wish I could go back and buy a lot of stuff from Siegel, but that ship has sailed. It is a Blanchard, so possibly it is unfair to compare it to the other knives which are seemingly made for a bookbinders. In terms of age, the big one on the left just looks older, to me, but I could be wrong. Next PostNext 1967 Electric Scissors. With Headlight.